Sunshine No. 1 is an independent shop on Glasgow's southside selling a wide range of art, gifts and cards from across Scotland. 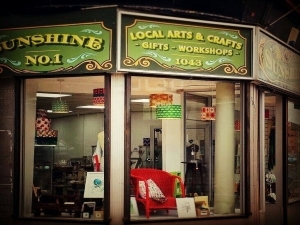 Sunshine No.1 was founded in 2015 and is dedicated to selling the best of arts and crafts. Our sellers all manufacture their own work and we are proud to stock such a wide range of wonderful items representing the best of Scotland. A programme of arts and crafts classes is also available. The maximum number at each class is 6 people, keeping the classes informal and friendly. For current classes please check the Facebook page or email GlasgowSunshine@virginmedia.com to be added to the mailing list. Sorry, but we have no upcoming events for Sunshine No. 1. If you know of an event taking place at Sunshine No. 1 or anywhere else in Glasgow tell us about it and we'll list it on the website, for free!